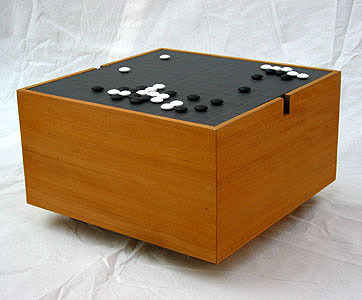 Go is a Japanese game of strategy played on a gridded board with black and white pieces. Traditional boards are painted onto massive blocks of wood that are similar in size to the table shown here. Instead of being solid, this table (which was made as a gift) is a hollow box with sled feet and a separate slate "board" that forms the top. The removable top allows the interior to be used to store books and game pieces. The grid of the playing field is was etched into the field using a T-square and a sharp awl. The box is made from agathis, which is a relative of the kauri wood traditionally used for Go boards.